Title: "Who wants to live forever?" 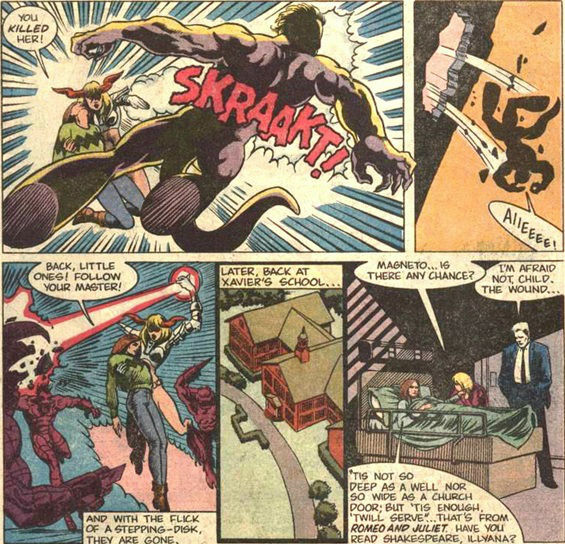 Cannonball interrupts Magik's Danger Room session to tell her that a lady has come to visit. The lady, Maire O'Connell, says that she's a former disciple of Belasco. Belasco has subsequently punished her with immortality, and she wants Magik's help in becoming mortal again. Magik decides to deal with this on her own. She doesn't want to put the New Mutants in danger, and says that Magneto probably wouldn't let them go. So she and Maire go on their own. They go to Belasco's tower. They fight their way past some demons and enter Belasco's library, and eventually find the right spell. 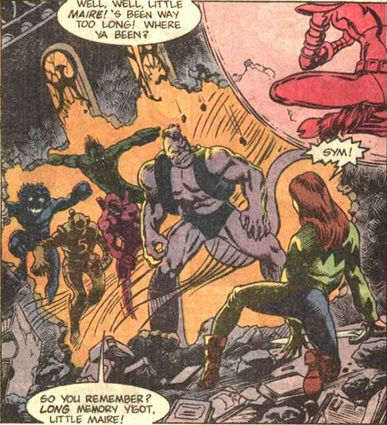 But while Magik is casting it, more demons show up, led by S'ym. Maire gets stabbed as Magik is casting the spell, and she's mortally wounded. But of course she wanted to die anyway, so i guess it's not a big deal. Based on where this is placed, it happens soon after New Mutants #52, which was a really nice story that had Magneto bonding with Magik and trying to help her with Limbo. It was a connection between the characters that went unexplored when the creative team shifted on New Mutants. If you were going to do a story like this that took place before Magik was regressed to infancy in Inferno, it might have been useful to explore that connection better. Instead we get a generic story. Chronological Placement Considerations: The MCP place this between New Mutants #52-53 (and after Fallen Angels). Magik is "no longer ruler in Limbo". S'ym is not looking techno-organic, but that could be just the way he's chosen to appear, or maybe Magneto's attack in issue #52 has temporarily removed his metallic bits. The other stories in this issue are covered in a separate entry.